" No man can return to being a boy. But there are interludes in a man’s life when, for a time, he can recapture the feeling that the world is a forgiving place and that he is immortal. " Gull is on the tall side, with average proportions in most other regards. He’s neither stocky nor slender, falling quite in the middle. His most striking feature is likely his large, slightly crooked nose, the result of a rather well-set break, even if it was never quite exactly as it once was again. His eyes are a light brown, around the same color as his hair, which he keeps cut short and meticulously neat. His skin is on the lighter side, but he tends to tan once the inevitable sunburn heals, and by the end of summer he can be quite dark. Gull, unlike his sister, was never really a person who could be considered reserved. He’s outspoken and friendly, determined to be chummy with just about everyone he meets, even if it’s a shallow friendliness at best. Gull just doesn’t really care about people aside from himself any more; he cared about Gust, but now that she’s gone, nobody else is really deemed important. He became a Healer primarily to benefit himself: in ensuring the good health of the Hold’s whers, he was also ensuring that they’d be around to keep him safe as well if really necessary. He’s methodical and reasoned in most of his approaches to problems. This has served him well in his studies, though when it comes to solving interpersonal problems he can be rather dense, since people aren’t necessarily rational and don’t always behave quite as he expects. Though he forms relationships at a near glacial pace, his regard, once given, is almost impossible to break. Once he has decided he cares, he'll stick by a person no matter how they might hurt or betray him. Worthwhile people are, in his estimation, so difficult to find that they’re worth holding onto through anything. Gull always said he was lucky: he was born with a built-in best friend. He and Gust were, as their parents called them, two pieces of one soul. It was like they just fit together; born within moments of each other and rarely apart, they were more accustomed to each other’s company than anyone else’s, and even as infants were wont to cry if the other wasn’t around. Though they didn’t necessarily look all that much alike, Gull taking after their mother and Gust after their father, nobody would ever doubt that they were brother and sister. They were, in short, as happy as two children could be. Both eventually apprenticed as Healers, Gull focusing on dragonkind and Gust on the humans that invariably accompanied them. Happiness could hardly last forever though: when Evander closed off Fort Hold, many supplies ran short, and when Gust suffered from a severe infection following a fall, the herbs to treat her weren’t in sufficient abundance, and what they did have simply wasn’t working. For a few months, Gull blamed himself for his sister’s death. He was a Healer too, after all; he should have been able to do something. Eventually he shifted the blame to Healers in general: why couldn’t they figure something out to help her? Gust had been young, and otherwise largely healthy. She should have been the optimal patient. Instead she’d died. Eventually, he blamed the Hold and all its folk: if they’d only done something about Evander earlier, instead of waiting for some wild animal to do him in, they might have had enough supplies. But in time, he learned to accept that whose fault it was didn’t really matter. What had happened, happened, and couldn’t be undone. Refusing to move on didn’t hurt those who he thought hadn’t done enough, but only hurt himself. So he continued with her studies, mostly learning how he might treat the Hold’s whers, as well as those of the outlying cotholds if it was ever needed. Eventually, he decided that maybe, if the opportunity arose, he’d even try for a wher himself. Impressed white Gulsk when Vellaren was giving out eggs. The white is much... taller than he would have expected. Gulsk is a beautifully striking wher to behold! The majority of his body is a bright, almost reflective, black color. Around the edges of his tail and down his legs, small white lines make him stand is stark contrast, giving him the look as if he was glowing under the light of the moons. His face, however, is a snow white color with dark hollows around his eyes, making him appear as if there is nothing but a skull there! 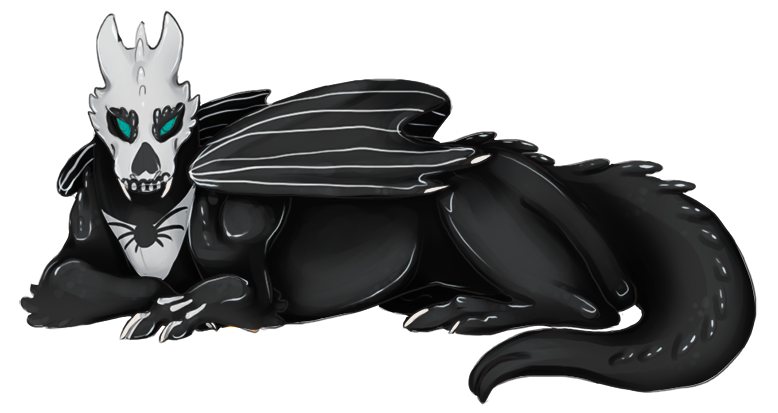 More highlights on his front paws give the illusion of bone, while his chest has a big patch of white, as if to highly the spidery black markings scrawled there. As if to finish out the package, thin pinstripes of white dart down his wings. He is well spoken, for a wher, with a light male timbre to his voice. Gulsk is a highly curious and wickedly intelligent creature. He is a wher who needs things to engage him; when he get bored, his attentions wander and he begins to get into other people's business in an attempt to find something to keep him entertained and busy. He means well! It's just...he does not do well when idle. His curiosity makes him very accepting of other people and different ways of doing things, and he is very compassionate in general, generally wanting the best for not only his people but for everyone involved. He can lose sight of what matters most when he is buried in a project or becomes fixated on something, so his handler will need to help him keep on task and give him gentle reminders. He really does have great ideas! He is one who will find ways to refine and inspire new tactics and plans for his kind, and he'll always support and nurture people close to him. He's very encouraging and uplifting, wanting to make sure everyone has a chance to shine. He can be a little hard on himself, so he'll need help to remember to be kind to himself from time to time. Gojira is, on occasion, a rather intimidating little thing. 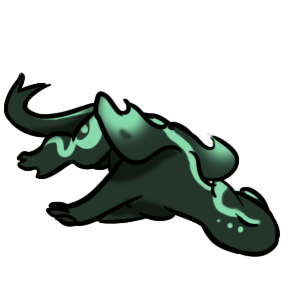 She's large for a garnet, and often likes to stomp clumsily around on her hind legs, knocking things and occasionally very small people over. She'll quickly have several small scars from running into things that are larger than her on a regular basis, but she doesn't seem to care. She's a rather pretty dark pastel pink all over, with darker marks on her hind legs and near-white spots all over her face. Gojira is a right little terror. She takes delight in knocking things over, though she doesn't care if she breaks them, just that she seems to think that nothing in her general vicinity should be upright. When on the ground, she rarely walks on all fours, instead preferring to stomp about on her hind legs, occasionally using her tail for balance. She'll often roar while doing so, attempting to be a big scary monster. She takes a special sort of joy from tormenting children, and Gull usually has to keep her away from the youngest apprentices.